Heads up – Mother’s Day falls on March 11th, so you’ve got exactly 10 days to pick up a present which will make you Mum’s favourite. Tough call? Of course – so imagine my relief when M&S sent a very tempting email detailing all of their top gift ideas. 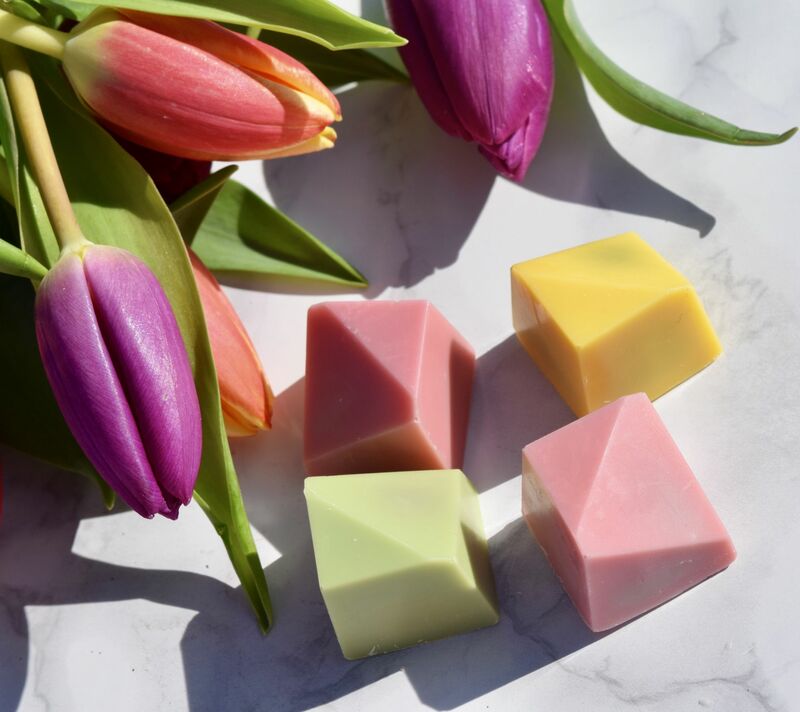 In between stunning bouquets of flowers and tins of biscuits, were some of the most beautiful Spring-inspired treats I’ve seen. 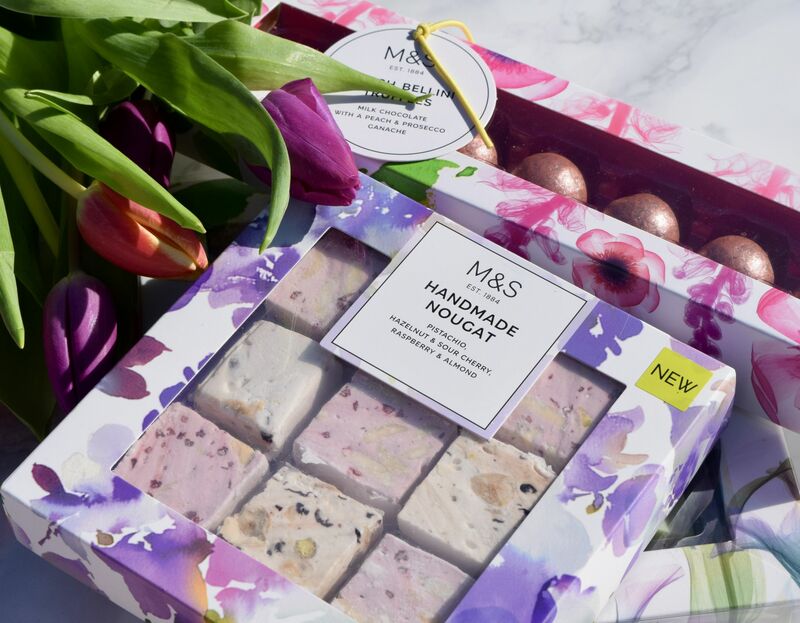 Since I’ve been running around with a schedule which feels jam-packed, M&S very kindly sent over some of my favourites, so I could cross the ‘presents for Mum’ job off the list. 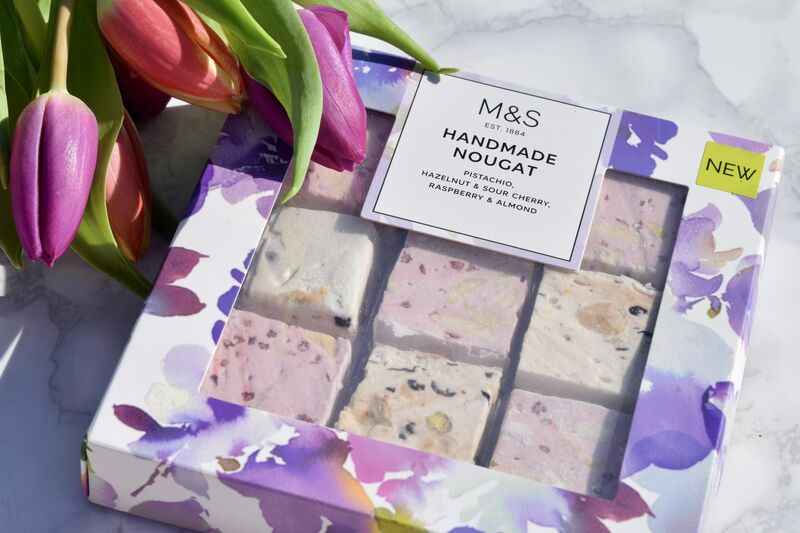 The first of the goodies to be unwrapped was the box of handmade nougat. Filled with three flavours – Pistachio, Hazelnut & Sour Cherry, and Raspberry & Almond, these are a perfect treat to enjoy alongside an afternoon cup of tea or coffee. Studded with generous chunks of fruit and nuts, these are absolutely stunning as well as being absolutely delicious. The treats are suitable for vegetarian mums, and are priced at a reasonable £5 per box. The Peach Bellini Truffles certainly stood out in the box – packaged in a beautiful, flower-covered box, the truffles shine inside like gems. 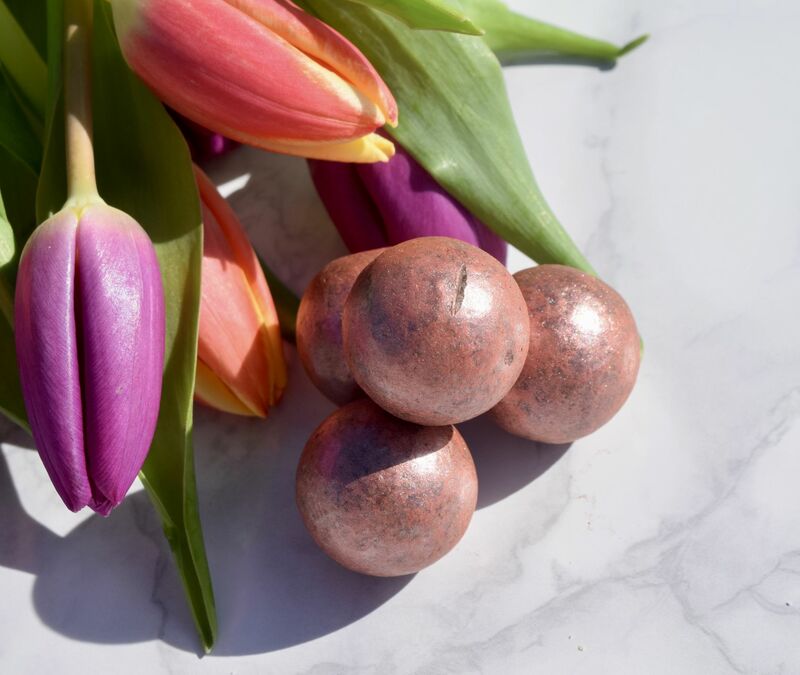 These glossy peach truffles might just be the most glamorous chocolates on the market right now, so if your mum is a bit of a glamazon, she’s going to love these! Crisp milk chocolate shells hold a rich, fruity ganache filling made with real prosecco and peach. The mix of fruit and chocolate is perfect for a treat, and the hint of booze is just delicious! 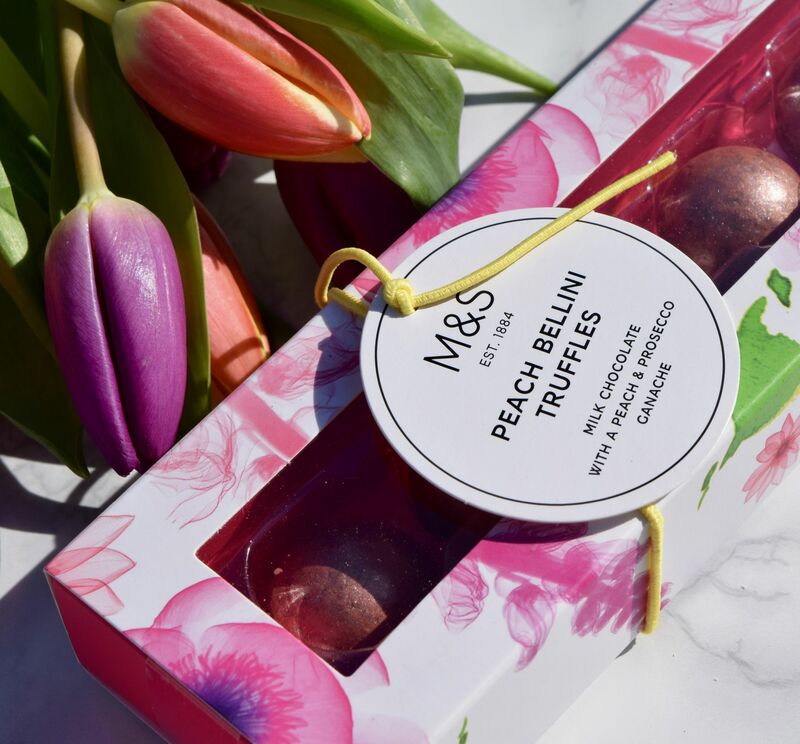 The Peach Bellini Truffles are priced at £4, which makes them a perfect addition to any Mother’s Day hamper you might be planning. 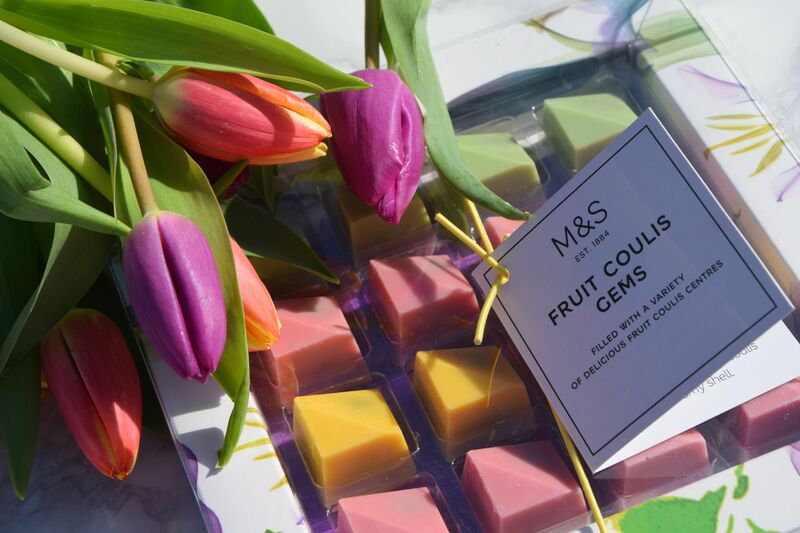 Last up, but certainly not least are these stunning Fruit Coulis Gems. 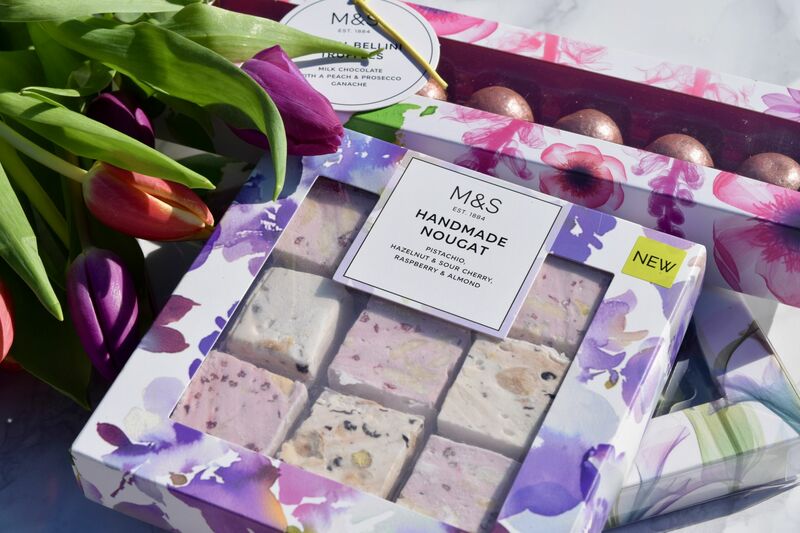 Perhaps M&S’ most eye-catching product in the Mother’s Day collection. A mix of fruity centres, all encased with crisp yet creamy tasting shells, these are absolutely stunning! As delicious as they are, I can’t help but be obsessed with how good these look! They’re priced at £8 per box, and are sure to impress! Thank you so much to M&S for all of my gorgeous Mother’s Day treats!